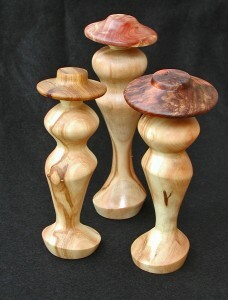 Opening July 10th at the Manitou Springs Business of Art Center, ‘3 Ladies from Aspen’ will join dozens of other woodturnings by the members of the Pikes Peak Woodturners. The hats are turned from contrasting scraps of cedar, burl, and canary wood, and glued on at an angle. The tallest figure is 10.5 inches.